Home / News / Features / Discover T1X / Chestermere Heating and Cooling Ltd.
Chestermere Heating and Cooling Ltd.
About five years ago, Kyle Fagnan was inspired to open Chestermere Heating and Cooling Ltd. when commuting to his job in Calgary. As he was heading west, Fagnan noticed that there was a constant stream of HVAC trucks heading into Chestermere from Calgary. “I was like, wouldn’t that be great if there was something in Chestermere that was just kind of dedicated to the people of Chestermere,” said Fagnan, who has lived in Chestermere for a little over 10 years. 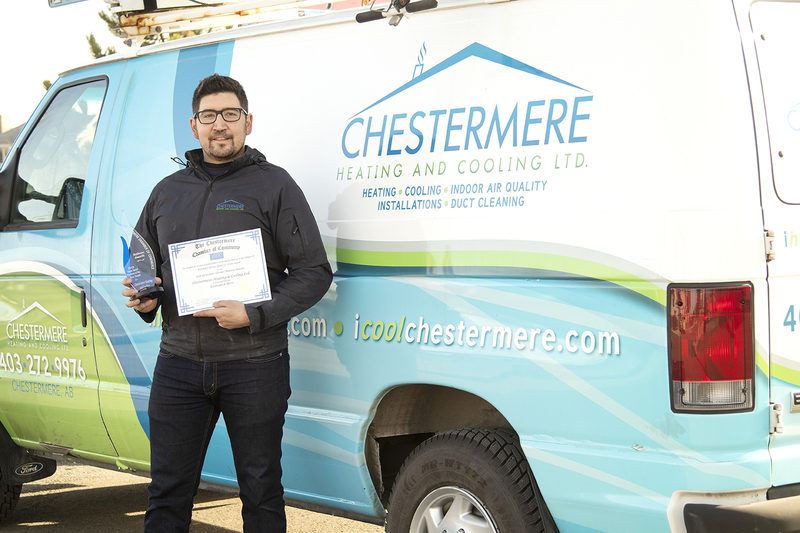 He decided to take his decades of industry experience and open his first business, Chestermere Heating and Cooling Ltd.
“Being local its nice, when I go to people’s homes, they are not just a customer, to me they’re a neighbour,” said Fagnan. The learning curve from employee to business owner was steep. “I think my biggest challenge right now is just time management,” said Fagnan. When he worked for someone else all Fagnan had to worry about was the job in front of him. Now he has to be mindful of, and make time for, all the other tasks that keep his business running. “Making sure I have time for the paperwork, make sure I have time for picking up material, have time to actually do the job,” he said. Fagnan has had help from industry mentors, including his family. In particular, Fagnan looks to his father’s example. “My dad started Fagnan’s Furnace in Calgary…in 1968 and he still heads the office. “He’s in his 70s and still working six days a week, 10-hour days,” said Fagnan. “He’s definitely my role model for business,” he said. As a business owner and neighbour, Fagnan is dedicated to quality work on every job.